VA Form 5655, Financial Status Report is a document used for claiming a payment plan, the acceptance of a compromise offer, or as a waiver for debt. The information collected via the VA Form 5655 is used by the Department of Veterans Affairs (VA) to determine eligibility for the corresponding claim. Individuals eligible to submit the request include veterans, beneficiaries, payees, representatives acting on the debtor's behalf, or the representatives of an estate. The latest version of the form was released by the VA in June 2009. 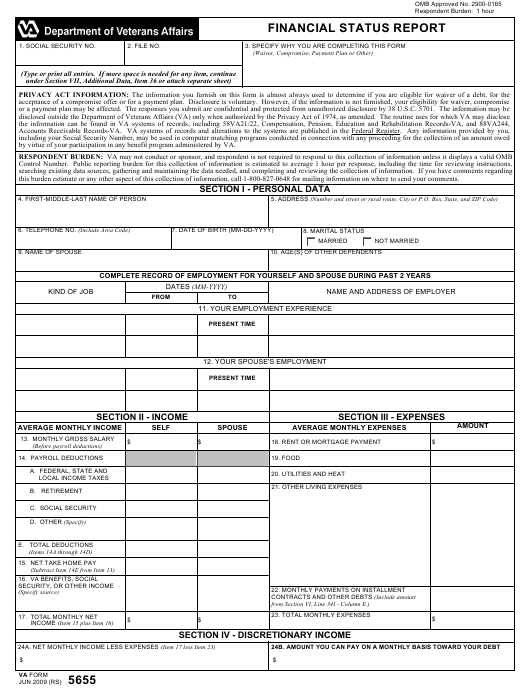 An up-to-date VA Form 5655 fillable version is available for download below. Filing the form is voluntary. However, if the requested data is not provided it may affect the applicant's eligibility for waiver, compromise or a payment plan. A printable non-fillable version of the VA 5655 can be found on the Department of Veterans Affairs website. The form - also known as the Financial Status Report Portable Document File - should be printed, filled out with a pen or typewriter, and mailed or faxed. How To Fill Out Va Form 5655? Where To Mail Va Form 5655? by virtue of your participation in any benefit program administered by VA.
this burden estimate or any other aspect of this collection of information, call 1-800-827-0648 for mailing information on where to send your comments. etc. DO NOT INCLUDE LIVING EXPENSES. NOTE: If repayment of a debt is not on a monthly basis, write "0" in column E and describe arrangements to repay in Item 36.
knowing it to be false. No filling guidelines are distributed with the form. Contact the Department directly if you need help with your VA Form 5655 by calling their toll-free hotline at 1-800-827-0648. Step-by-step filing instructions can be found below. Item 1 requires specifying the applicant's Social Security Number. The file number is entered in Item 2 and can usually be found in the upper right corner of most letters received from the Debt Management Center. The reason for completing the form - either Compromise, Payment Plan, Waiver, or Other - should be stated in Item 3. Section I requires personal information on the debtor. Their full name, address, marital status, telephone number, and date of birth should be provided in Items 4 through 8. Married debtors should indicate the name of the spouse in Item 9. Item 10 requires specifying the ages of other dependents - if any. Item 11 should contain the debtor's record of employment for the last two years. The spouse's employment experience is described in Item 12. The income of the debtor and their spouse must be described in Section II. It is obligatory to include income of the debtor's spouse in the document since the VA Debt Management needs to consider the total household income in order to determine the debtor's ability to pay and the amount they are able to pay monthly. The debtor does need to send proof of income or expenses when submitting the VA 5655. However, if the VA Debt Management officials will have additional questions, they may request some proof later. Item 13 is for specifying gross monthly salary without payroll deductions. Items 14A through 14D should describe payroll deductions. The total deductions amount must be indicated in Item 14E. To complete Item 15, it is necessary to subtract the sum in Item 14E from the sum in Item 13. Any VA benefits received by the debtor or spouse should be identified in Item 16 - Pension, Compensation, or Other Income. This also includes social security payments and part-time job income. Section III is reserved for describing the debtor's average monthly expenses, including rent, mortgage payments, food expenses, utilities, heat and other living expenses. Monthly payments on installment contracts and other debts are identified in Item 22. Total monthly expenses are provided in Item 23. Section IV requires an indication of the net monthly income fewer expenses and the amount the debtor can pay on a monthly basis. Section V describes all of the debtor's assets and their value. This includes all money kept in bank accounts, cash on hand, cars, boats, real estate, etc. All debts needed to be paid off in regular monthly installment are listed in Section IV. Section VII describes any previous cases of legal bankruptcy. For the document to be eligible for further processing, it should be signed and dated by the debtor and their spouse in Section VII. No payments should be sent with the form when filing the VA 5655 to accompany a request for a compromise offer. If the document is filled out to request a monthly payment plan, the payment may be sent along with the completed form. When requesting a waiver, it is necessary to attach a letter that explains the reason for the request. Via Fax through the number 612-970-5798. Via Email at dmc.ops@va.gov with the purpose of the form - either Payment Plan, Waiver, Repay, or Repay and Waiver - specified in the subject line. It is strongly recommended to keep a copy of each document sent to the Debt Management Center.